Author and futurist Isaac Asimov's "Foundation" trilogy was launched aboard SpaceX's Falcon Heavy rocket. The text was encoded by inventor Peter Kazansky in a high-storage, ultrastable quartz disc with a lifetime of millions to billions of years. When SpaceX's record-breaking Falcon Heavy rocket made its first test launch in early February, the craft didn't just hurl Elon Musk's shiny red roadster and spacesuit-clad mannequin to space. 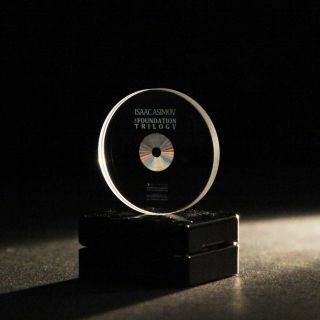 It had another, smaller payload, which at first glance seems much less impressive: a 1-inch-wide (2.5 centimeters) quartz disc with Isaac Asimov's "Foundation" trilogy encoded in laser-etched gratings. The famous science fiction series is only the beginning of the discs' planned contents. At a time when traditional hard drives are just breaking into the terabyte range, the quartz medium can hold up to 360 terabytes per disc. It also boasts a life span of 14 billion years. That's longer than the current age of the universe. This disc was symbolic; future devices will contain much more, and more useful, information. But the technology speaks to grander issues that humanity is now pondering: becoming a multiplanetary civilization, storing information for thousands or millions of years, and contacting and communicating with other intelligences (alien and Earthling). Humans have faced challenges like these before. Ancient civilizations built monuments like the pyramids and left artifacts and writing, sometimes deliberately. Later researchers have used this material to try to piece together ancient worldviews. However, in the modern era, we've set our sights much further: from centuries to millennia, from one planet to interstellar space, and from one species to many. Scientists encode information into a quartz disc as nanometer-scale gratings. The laser they use must produce pulses as short as a few femtoseconds, or quadrillionths of a second. This is the timescale of motions within molecules. Durability and redundancy are crucial when preserving information over the long haul. That sentiment resounds across the field of archiving, said Laura Welcher, who oversees the Rosetta Project, a long-term archive of the world's languages at the Long Now Foundation, a partner of Arch. "[Having] lots of copies keeps stuff safe," she told Space.com. That's why Spivack's foundation plans to create Arch libraries en masse. "When you look at the Voyager disc or other attempts [to preserve culture] — time capsules or sending things into space — they're sending one thing to one place one time," Spivack said. "We're sending many things to many places all the time." A pair of records was included on the Voyager spacecraft containing music, sounds of Earth, images recorded in analog and greetings in many languages. The record's aluminum jacket includes symbolic instructions for playing the record using the included cartridge and needle. The preserving power of redundancy also applies to humanity as a whole. Becoming a multiplanetary species is "insurance of life as we know it," Musk said in an interview with Rolling Stone magazine. Given enough time, large disasters will happen. It's wise not to have all your eggs in one basket. "We're at an elevated level of both opportunity and risk right now," Spivack said. The ability for a single person, or small group, to destroy civilization, intentionally or accidentally, is greater than it ever was. "I think it's a rite of passage that we have to get through as a civilization," he said, "and it's probably likely that most civilizations don't get through it." SpaceX has said its goal is to facilitate a spacefaring civilization. "They're doing the spacefaring part of that sentence," Spivack said. "This is the civilization part." In addition to their work on innovative technologies, the people designing these artifacts face many philosophical challenges. For instance, they need to make sure that humans, or other life-forms, that discover our messages will recognize them and can decode them. It's impossible to account for every type of intelligence that might encounter our records in the far future. Maybe they're some silica-eating life-form, Spivack said. "They might just think it's a tasty snack," he said. So, a storage device has to be intriguing enough to stir curiosity and presented in a way that suggests that the object contains a message. Spivack asked notable computer scientist Stephen Wolfram, inventor of the computation software Mathematica and online problem-solving engine Wolfram Alpha, to help the Arch team work through these quandaries. Wolfram's role is to "ask the hard questions, keep us intellectually honest," Spivack said. The two men have different perspectives on how to approach these challenges. "Nova [Spivack] told me about his project, and I was like, 'Your project is philosophically doomed,'" Wolfram chuckled. He said the cultural, and perhaps biological, differences between us and the recipients of our messages may be insurmountable. Nevertheless, he said, the mission was intriguing enough that he agreed to serve as an advisor. "The basic issue is how do you make something understandable when you don't have a shred of shared cultural context?" Wolfram said. "I think that, for better or worse, what we have here is a philosophically unsolvable problem." Wolfram came across this Persian inscription during research for his book "A New Kind of Science." Lacking cultural context, he could not tell if the writing was a mathematical representation, a cellular automaton or something else. Eventually, he learned that it was a stylized list of the 62 attributes of Allah. Consider the differences between human and artificial intelligence. Google recently trained a computer program to detect heart-health risks by analyzing the blood vessels at the back of the eye. The company developed the algorithm's acumen using medical data from nearly 300,000 patients. It's likely that the distinctions important to the AI are not ones that are meaningful to us. Similarly, when studying ancient artifacts, it's difficult to pick out which aspects of an ancient geometric pattern were important to its creators and which were incidental. As these examples suggest, the real problem in preparing to communicate with alien life-forms is that we have only one species to test our assumptions on. And that species is also the one conducting the tests. Wolfram's skepticism shouldn't be mistaken for cynicism, though: The communication barrier may be philosophically unsolvable, Wolfram said, but "that doesn't mean we shouldn't try." Spivack agreed that communication will be difficult. But he also pointed out that humans have successfully communicated things through the ages, referencing the Dead Sea Scrolls and Egyptian hieroglyphics, among other examples. If any being discovers our archives in the near future, the individual will probably be a human. With this in mind, Spivack restricted the scope of the Arch Mission to humans and human-like organisms. Constraining the target audience reduces many of the philosophical problems and provides a foundation to begin designing the devices. For instance, humans are visually oriented and use symbolic writing, so crafting an artifact that's visually intriguing is a good place to start. Unfortunately, plenty of animals and natural phenomena create interesting designs that often convey no message at all. Consider male white-spotted pufferfish, which construct ornate patterns in the sand to attract mates. To what extent these patterns convey a message, and what that message may be, currently eludes scientists. Nevertheless, Spivack said it's reasonable to expect that our decedents will recognize visual cues like those on an Arch library given humanity's history of using symbols and written languages. Many factors will separate the minds of the future from the information we leave for them: language, culture, technical conventions and maybe even biology. Successful communication requires minimizing these barriers. When designing any archive, it's important to weigh the relative strengths of different ways of encoding information. "Every layer of encoding adds additional complexity to the decoding," said Welcher at the Rosetta Project. If we were to encode the story "Jack and the Beanstalk" into DNA, Welcher said, there would be five layers of abstraction: 1) human experience > 2) spoken language > 3) written language > 4) digital information > 5) DNA nucleotides. The Arch discs have a similar level of encoding, but Welcher said the trade-off in simplicity is worthwhile given the media's incredible durability. Rosetta Disk, a physical component of the Rosetta Project, chose a strategy that used less encoding: recording information as pages of actual text, like microfiche. Existing technology can inscribe text so small that reading it requires an electron microscope, Welcher said, but "we didn't want to erect such a huge barrier to access, so we've kept the pages to the size [where] they can be read with optical magnification." The Rosetta Disk contains over 13,000 pages of information on more than 1,500 human languages. Each page is microscopically etched onto the nickel disk. The box would also contain tools to decode the messages. For instance, the package would include lenses and diagrams for a microscope to read the analog devices, which have actual images. The foundation has also designed small Raspberry Pi computers and DVD players that can read multi-thousand year durability DVDs, which are made from special materials. Those computers would go in to the box with the drives and spare parts. The foundation would also include instructions for how to read more advanced devices, like the quartz discs, in the other media, Spivack said. These delicate electronics can last a long time if they're shielded from debris and radiation, especially in an environment without oxygen, Spivack said. But even after they've degraded, the components will still provide a blueprint that the recipients could use to re-create the technology and retrieve the devices' information. Archivists can also take advantages of historical insight in their designs, Spivack said. "In cases where we were able to understand things, it's because there was a lot of data and it was distributed in many places." he said. "And in some cases, there were translations or connections to other known data sets." In this light, Spivack plans to include primers — which are generally short introductory material — in all of the devices. However, his idea is to include what he called "primer overkill": vast amounts of visual and encoded instructions for accessing, translating and understanding the information on each device. Assuming we can get a message out for posterity, or extraterrestrial visitors, and supposing that the audience can decode the message, that leaves us with the question of what to tell them. Many scientists and futurists have suggested using mathematics in our messages. Mathematics is universal and fundamental, and it can be derived from first principals. With a little extra work, you can even encode information we've learned about the how the universe works, namely science findings. But these very attributes may make mathematics the most boring thing we could send to aliens, or preserve for our descendants, Spivack and Wolfram said. "When I first started this, I was all about passing down science," Spivack said. "But the more that I've grown and thought about this, the more I've come to understand that … you can almost think of them [science and math] as commodities in a sense: that everybody in the universe who reaches a certain level has them," he said. When pondering what our decedents or other intelligent life might want to know about us, it's worth considering what we try to learn when we study cultures, individuals and other animals. We commonly seek to find out what is life like for them and why they make the decisions they do. This suggests that what's interesting and meaningful about us is the set of the values and experiences that make us unique. Wolfram echoed this sentiment. "If we want to communicate about ourselves, [we should] send things that are special to us," he wrote in a comprehensive blog post on the topic. Humanity should focus on preserving and communicating its experiences and worldview, for inquisitive extraterrestrials or archeologists 10,000 years hence. So, include artwork: images of paintings, sculptures and ornaments from the Paleolithic to the modern age. Encode music, language and prayers. Give them our stories, from sacred texts to high literature and folklore. Provide records of our history, traditions and customs. Share with them the diversity of life on Earth through pictures, recordings and DNA. In short, give them all the stuff that makes us who we are and that can never be replicated or replaced. Ultimately, whatever we choose to include in our archives will likely reflect more on what we consider important today than what future recipients will want to know, Wolfram said. And in that light, he believes projects like the Arch Mission are useful because they force society to consider what our legacy will be.